For the person who enjoys staying home, slips into sweatpants within a minute of getting home, and is often snuggled up in a blanket…this gift guide is for them. These gifts for homebodies are perfect for the person who enjoys the simple pleasures of being at home. My husband and I were having a debate the other day on whether or not the word “homebody” is positive or negative. What do you think? He said he’s always heard it used in a negative way, but then I reminded him Joanna—y’know Joanna Gaines, my bestie—just came out with a book titled Homebody. (P.S. Add it to your Christmas list if you don’t have it yet! It’s so good and really got me thinking.) Grab your copy of Homebody here. 40% off right now! Homebody: /ˈhōmˌbädē/ a person who likes to stay at home, especially one who is perceived as unadventurous. A person who enjoys the warmth and simple pleasures of being at home. Yes, please. I’m not ashamed to categorize myself as a homebody. I do love staying at home. And although I’d love to consider myself an adventurous person, it’s just not me. So, rather than fighting it, let’s embrace it. If you’re a homebody or know one, check out these gifts for homebodies. For the person who enjoys staying home, slips into sweatpants within a minute of getting home, and is often snuggled up in a blanket…this is for them. The espresso machine and aprons are necessities for all homebodies to make staying at home easier even when you just want some froofy coffee and a fancy meal. Invite friends over for some hang out time and it’s a win-win. You get to stay in the comfort of your home and still hang out. I was expecting Joanna Gaines book, Homebody, to primarily just be pretty pictures—which I was totally okay with—but, I had a huge ah-ha moment just reading the introduction. I’m about 4 chapters in and LOVE it! It’s seriously so good! Of course, any homebody appreciates some good cozy gifts like sweats, a robe, or slippers. Check out some great cozy gift ideas here. 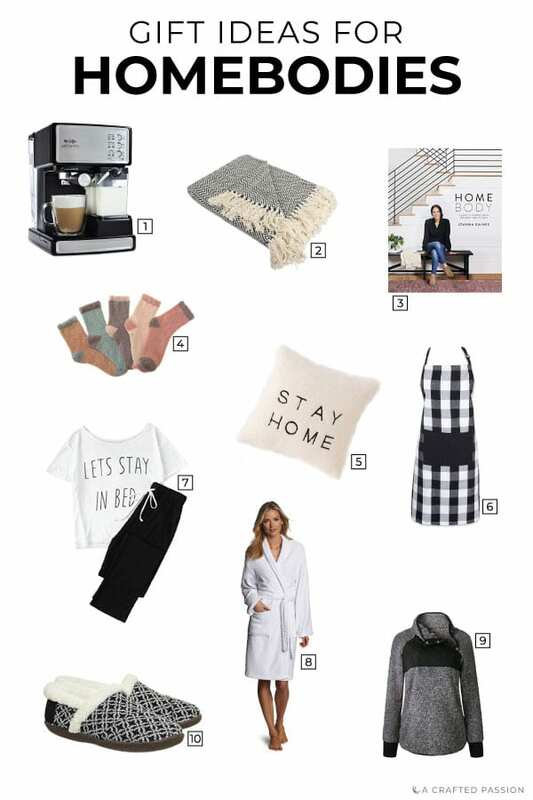 If none of these gift ideas have jumped out at you yet, I have a full Amazon list filled with gifts of all price ranges for homebodies. Click the link below to see them all. Most of them are available with Amazon Prime, so free two-day shipping is included. If you don’t have Amazon Prime, now is a great time to get it before the holidays. Try out 30 days free here! If you’re a homebody, what’s on your gift list this year?